Rock Hand: Stylized purple hand with index and pinky fingers extended in a “rock out” or “horns” gesture. 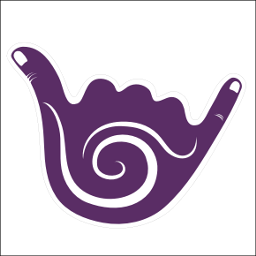 Sign language letter I: Stylized purple hand with pinky extended in the American Manual Alphabet sign for the letter I.
Shaka: Stylized purple hand with thumb and pinky finger extended in a “shaka” or “hang ten” surfer gesture. Although I like the symmetry of the horns/hang 10 hands, the signed “I” is the cleverer selection since it does refer back to your name. I like the drawing, too – stylized but recognizable, and fluid. This entry is filed under Announcements, Highlights, Imprudence . You can follow any responses to this entry through RSS 2.0 . You can leave a response, or trackback from your own site.